Union leaders will get details of deal in Detroit on Wednesday and then take it to the membership for a ratification vote. The UAW and General Motors reached a tentative agreement late Sunday said to include "significant wage gains and job security commitments," averting a strike minutes before the midnight deadline. 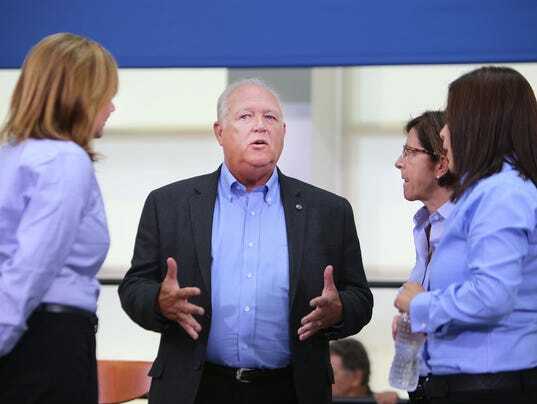 Local union leaders who make up the UAW National GM Council will meet in Detroit on Wednesday to discuss and vote on the agreement after which details will be released and members will have ratification votes across the country. The new four-year deal is expected to largely mirror the one ratified by Fiat Chrysler Automobiles on Thursday in terms of basic wages. In that agreement all workers can eventually reach a top pay of $29 an hour in eight years or less, eliminating the hated two-tier wage system. There is also an expectation that items such as signing and performance bonuses, lump sum payments and profit sharing will be richer because GM is a larger, more profitable company. But General Motors also must remain competitive with other automakers whose hourly labor costs are as much as $10 an hour lower. And while GM is registering strong profits, it is also committed to maintaining a 10% profit margin. The UAW-GM bargaining committee said an agreement was reached at 11:43 p.m. Sunday. At 11:59 p.m. the old four-year agreement was set to expire. Few details were released but the union statement said they "secured significant gains and job security protections." "Your UAW-GM Bargaining Committee has secured significant gains and job security protections in a proposed Tentative Agreement with GM," the union announced. "Terms of the four-year agreement are not being shared publicly to allow the International UAW to inform their membership about the agreement and conduct a ratification vote," the company said. "If ratified, the agreement would cover about 52,600 GM employees in the United States who are represented by the UAW." UAW locals were making strike preparations in advance of the Sunday night deadline and workers were also being told to stay on the job unless told otherwise. The union could have chosen a U.S.-wide strike or a targeted one where select plants go down. GM earlier this year announced $5.4 billion in planned investments in the U,S. The UAW made a similar strike threat last week as it negotiated with Fiat Chrysler but the two sides reached an agreement just before the deadline and there was no walkout. 1. Is the signing bonus larger than $4,000? 2. Is there a cap, or limit, on the percentage of Tier 2 workers GM can hire over the next four years? 3. Is there more for UAW retirees than the $1,000 voucher on a new vehicle that FCA offered? 4. Is there any change in the profit sharing formula? 5. Is there any new information about where future vehicles will be assembled?